Here’s a tip top super stomper from Innershades. It’s his second release for Wicked Bass Records after the absolutely ridiculous That Girl EP, and we’re delighted to be working with him again. Title track ‘Gravure’ is an belly-wobbling house beast, the kind of beat that sounds like its left the club and gone on holiday in the Med. 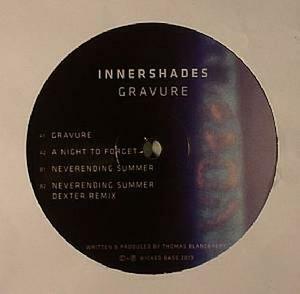 If ‘Gravure’ is splash hit designed to put a smile on your face and some sweat on your forehead, ‘A Night to Forget’ is its moodier older brother, five minutes of elasticated bass mutations and piercing synths. On the flip, ‘Neverending Summer’ slows things down to a mellow sweetness with some tropically touched percussion work and synths that swing across the beats like monkeys through palm trees. Finally we’ve got Dutchman Dexter on remix duties, switching up the original into something more ferocious. Hot stuff!